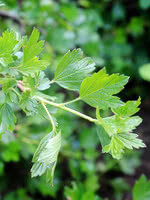 Northern Gooseberry is a small, ornamental quality native shrub with prickly stems. You can plant it anywhere you'd plant Prickly Rose or Common Wild Rose, such as your yard. Most people find Northern Gooseberry berries a bit tart for significant fresh eating but they are good for baking, wine or jam.